Hepatocyte nuclear factor-4α (HNF4α; NR2A1) is an orphan member of the nuclear receptor superfamily involved in various processes that could influence endoderm development, glucose and lipid metabolism. A loss-of-function mutation in human HNF4α causes one form of diabetes mellitus called maturity-onset diabetes of the young type 1 (MODY1) which is characterized in part by a diminished insulin secretory response to glucose. The expression of HNF4α in a variety of tissues has been examined predominantly at the mRNA level, and there is little information regarding the cellular localization of the endogenous HNF4α protein, due, in part, to the limited availability of human HNF4α-specific antibodies. Monoclonal antibodies have been produced using baculovirus particles displaying gp64-HNF4α fusion proteins as the immunizing agent. The mouse anti-human HNF4α monoclonal antibody (K9218) generated against human HNF4α1/α2/α3 amino acids 3–49 was shown to recognize not only the transfected and expressed P1 promoter-driven HNF4α proteins, but also endogenous proteins. Western blot analysis with whole cell extracts from Hep G2, Huh7 and Caco-2 showed the expression of HNF4α protein, but HEK293 showed no expression of HNF4α protein. Nuclear-specific localization of the HNF4α protein was observed in the hepatocytes of liver cells, proximal tubular epithelial cells of kidney, and mucosal epithelial cells of small intestine and colon, but no HNF4α protein was detected in the stomach, pancreas, glomerulus, and distal and collecting tubular epithelial cells of kidney. The same tissue distribution of HNF4α protein was observed in humans and rats. Electron microscopic immunohistochemistry showed a chromatin-like localization of HNF4α in the liver and kidney. 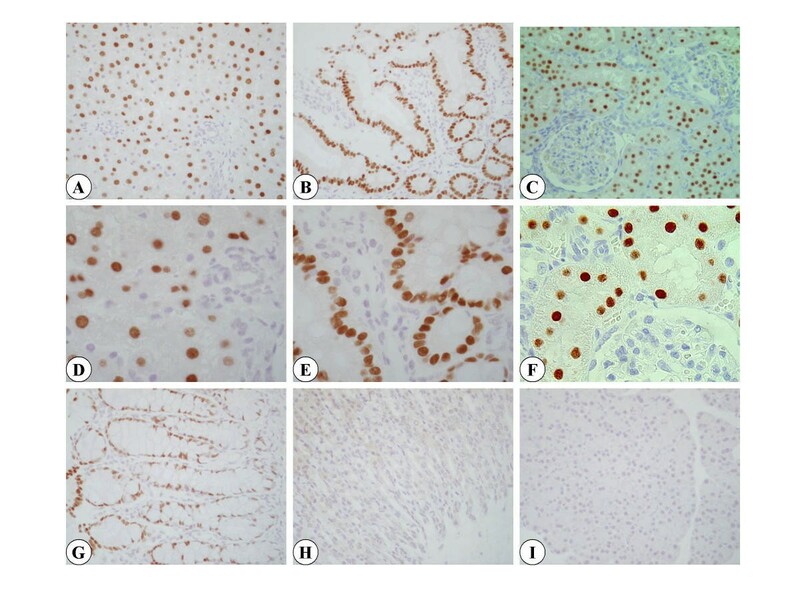 As in the immunohistochemical investigation using K9218, HNF4α mRNA was found to be localized primarily to liver, kidney, small intestine and colon by RT-PCR and GeneChip analysis. These results suggest that this method has the potential to produce valuable antibodies without the need for a protein purification step. Immunohistochemical studies indicate the tissue and subcellular specific localization of HNF4α and demonstrate the utility of K9218 for the detection of P1 promoter-driven HNF4α isoforms in humans and in several other mammalian species. Hepatocyte nuclear factor-4α (HNF4α; NR2A1), a member of the nuclear receptor superfamily, is one of the key regulators of hepatocyte differentiation in mammals [1–3]. Like other members of the nuclear receptor superfamily, HNF4α possesses two DNA-binding domains that consist of a conserved zinc finger motif, and a ligand binding domain to facilitate activated transcription in vitro and in vivo. HNF4α binds DNA only as a homodimer and is activated by fatty acyl-CoA thioesters , although HNF4α is also capable of promoting transcription in the absence of exogenously added ligands. HNF4α appears to be an important element in the regulation of several hepatic genes, including those involved in the metabolism of fatty acids, lipoproteins, and lipids (apo A-I, apo A-II, apoB, apoC-II, apoC-III, medium chain acyl-CoA dehydrogenase, microsomal triglyceride transfer protein, and fatty acid-binding protein), glucose metabolism (aldolase B, phosphoenolpyruvate carboxykinase, and pyruvate kinase), P-450 enzymes (CYP2A4, CYP7A1, and CYP2C9), amino acid metabolism (tyrosine aminotransferase and ornithine transcarbamylase), hematopoiesis (transferrin), blood coagulation (factors VII, VIII, IX, and X), and liver differentiation (HNF-1α) [1, 5–12]. In addition, mutations of the HNF4α gene in humans are directly associated with maturity onset diabetes of young type 1 (MODY1), a rare form of noninsulin-dependent diabetes mellitus inherited in an autosomal dominant manner and characterized by defective secretion of insulin [13–15]. However, the precise physiological roles of HNF4α and mechanisms of gene transactivation are not yet clearly understood. Several isoforms of HNF4α have been cloned and characterized, and disruption of the HNF4α gene in mice results in a lethal embryonic phenotype characterized by a failure of the visceral endoderm to differentiate [16–18]. The HNF4α gene consists of 13 exons spanning over 70 kbp, among which several correspond to alternative exons (Fig. 1A). To date, less than 9 isoforms are proposed in mammals, and all are speculated to have different physiological roles in development and the transcriptional regulation of target genes. During early liver development, HNF4α transcription initiates from the promoter for HNF4α7 (P2 promoter) characterized by alternative first exons (1D), and HNF4α1 promoter (P1 promoter) transcripts become abundant . While HNF4α7 more efficiently activates the α-fetoprotein and transthyretin promoter than HNF4α1, HNF4α1 more efficiently transactivates the apoCIII promoter than HNF4α7. It has been shown that HNF4α4 containing two additional exons in the amino-terminal domain has a lower transactivation potential than HNF4α2 . However, numerous studies have been conducted on the tissue distribution of HNF4α using Northern blot analysis, RT-PCR, the RNAase protection assay and in situ hybridization using antisense RNA probes [20–24]. Although these reports show that HNF4α is mainly expressed in liver, kidney, intestine, and pancreas, its protein expression levels and distribution of HNF4α isoforms are still not fully understood due, in part, to the limited availability of specific antibodies. Schematic illustration of the human HNF4α gene, gp64 fusion proteins and Western blot analysis of HNF4α protein using K9218 made to the human HNF4α1/α2/α3 A/B domain. (A) Human HNF4α gene structure. Shown are the 13 exons of the human HNF4α gene. In the human genome, an alternative promoter referred to as P2 promoter is located 45.6 kb from the previously characterized P1 promoter. Exons are shown as boxes. 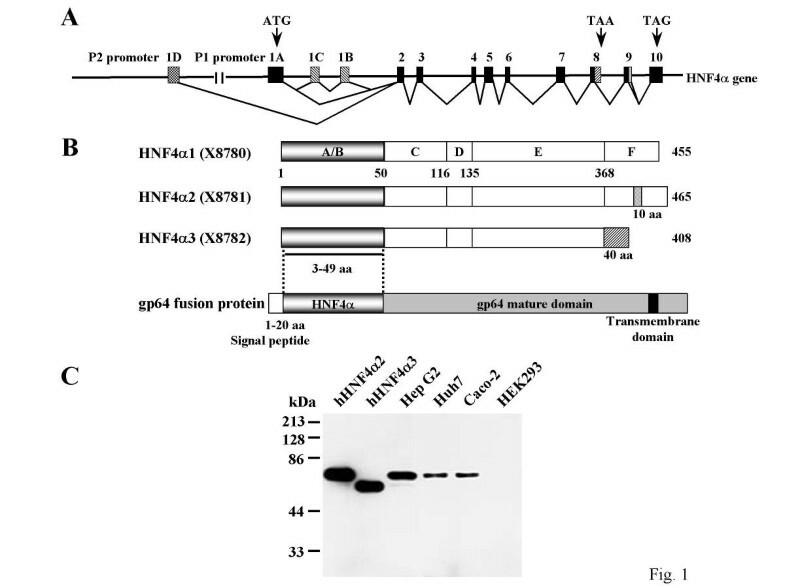 (B) Schematic representation of HNF4α isoforms and gp64 fusion proteins. The A/B domains of HNF4α1 /α2/α3 are encoded by exon 1A and by exon 2 for the last 19 amino acids. The amino terminal amino acids of HNF4α1/2/3 were inserted between the signal peptide and gp64 mature domain. (C) The specificity of K9218 was tested by Western blot analysis using HNF4α2- and HNF4α3-transfected CHO and cultured cells. Whole cell extracts from CHO cells transfected with human HNF4α2 and HNF4α3 (4 μg) or cultured cells (20 μg) were utilized for detection of the HNF4α. To clarify the tissue-specific expression and localization of HNF4α, we have produced monoclonal antibodies (Mabs) that specifically recognize this nuclear receptor. In this report, we show that Mabs can be produced using a recombinant baculovirus display system without the requirement of a protein purification step. 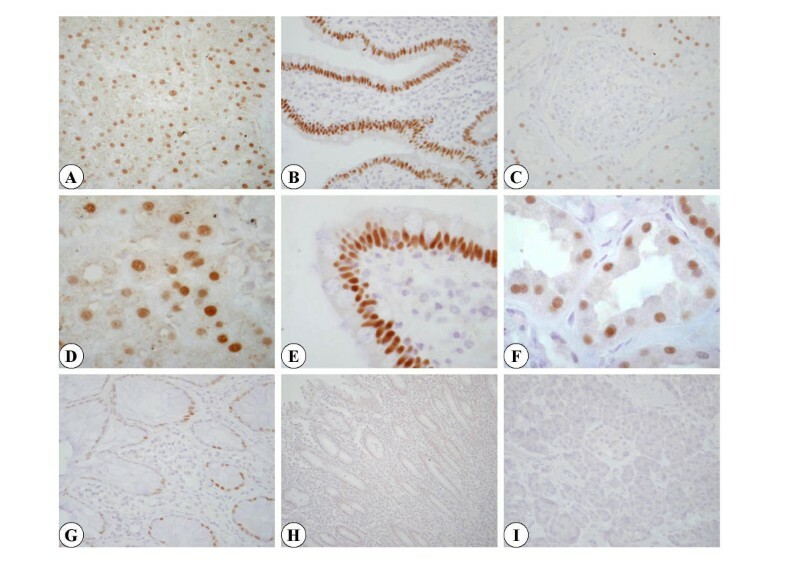 Immunohistochemical studies demonstrated that HNF4α isoforms originated from P1 promoter are expressed in liver, proximal tubular cells of kidney, intestine, and colon, but not in stomach and pancreas or other tissues. We also show that this method will be of great benefit in developing specific antibodies to investigate the physiological functions of the nuclear hormone receptors and can be applied to other protein targets. The structure of the human HNF4α gene and the gp64 fusion proteins are shown in Fig. 1. The sequence of the human HNF4α gene indicates that there are at least 9 different splicing variants, which are coded by 13 exons (Fig. 1A). Exon 1A corresponds to the first exon originally described for the HNF4α1 promoter (P1 promoter) and will generate 6 different isoforms. HNF4α1 is the initially identified transcript; HNF4α2 and HNF4α3 are splicing variants that contain a larger exon 9 or 8, generating a 10-amino acid insertion and a completely distinct F domain, respectively (Fig. 1B). HNF4α4/α5/α6 contains two additional exons in the amino-terminal region together with alternative combinations of the F domain as found in HNF4α1/α2/α3. HNF4α7/α8/α9 are expressed in a tissue-specific manner from a recently discovered promoter (P2 promoter) and are characterized by an alternative first exon (1D). In this study, the amino-terminal region of HNF4α1/α2/α3 was fused with gp64 and used to immunize mice. Figure 1C shows the immunoblot analysis of transfected and expressed HNF4α protein and endogenous protein expression in several cultured cells using K9218. The antibody generated using HNF4α-gp64 fusion protein as an immunizing agent, was able to detect not only baculovirus-expressed HNF4α-gp64 fusion protein (data not shown) but also CHO-expressed HNF4α2 and 3 in immunoblot analysis (Fig. 1C, lane 1 and 2). Although we immunized gp64 fusion protein containing exon 1A and a part of exon 2 regions, K9218 did not recognize CHO-expressed HNF4α7 and 8, suggesting its precise epitope is mapped during exon 1A (data not shown). These data indicate that K9218 at least recognizes HNF4α1/α2/α3 but not P2 promoter-driven isoforms. It has been reported that HNF4α is mainly expressed in the liver, kidney, intestine and colon. In accordance with previous reports, HNF4α protein was highly expressed in the hepatocellular carcinoma cell line Hep G2, Huh7 and the colorectal adenocarcinoma cell line Caco-2. On the other hand, the human kidney cell line HEK293 showed no expression of HNF4α protein (Fig. 1C, lane 6), as suggested previously [25, 26]. Intensive staining for HNF4α was observed using formalin-fixed and paraffin-embedded sections in the nucleus of hepatocytes in the liver, proximal tubules in the kidney, and mucosal epithelial cells in the small intestine (Fig. 2A,2B,2C,2D,2E,2F). Weak staining in mucosal epithelial cells in the colon was also observed (Fig. 2G). Sinusoidal cells and bile ducts in the liver (data not shown), glomerulus, distal tubules, Henle's loop, and collecting ducts in the kidney, pancreas (Fig. 2I), and mucosal epithelial cells in the stomach (Fig. 2H) were negative for HNF4α immunoreaction. There were no HNF4α-positive cells in other tissues. Immunohistochemical localization of HNF4α in human tissues. Paraffin sections were stained with HNF4α K9218 antibody. A positive reaction (brown colour) is seen in the nucleus of hepatocytes in the liver (A and D), mucosal epithelial cells of the small intestine (B and E) and proximal tubules of the kidney (C and F), and colon (G). Epithelial cells of the stomach (H), pancreas (I), glomerulus, distal tubules, and collecting tubules of the kidney are negative. Paraffin sections show the same staining pattern as frozen sections. Original magnification: D, E, F ×400; A, B, C, G, H, I ×200. The distribution of HNF4α-positive cells in these organs was confirmed in rat tissues using frozen (Fig. 3C and 3F) and formalin-fixed and paraffin-embedded tissues (Fig. 3). As in human tissues, a nuclear localization of HNF4α was observed in the hepatocytes in the liver, proximal tubules in the kidney, and mucosal epithelial cells in the small intestine and colon. The pattern of immunoreactivity in the nucleus was consistent with the chromatin distribution (Fig. 4). These findings indicate that HNF4α isoforms encoded by exon 1A are limited to the liver, kidney, and intestines and HNF4α is localized mainly in the chromatin compartment. Immunohistochemical localization of HNF4α in rat tissues. Frozen sections (C and F) and paraffin sections (A, B, D-E, G-I) were stained with HNF4α K9218 antibody. A positive reaction (brown colour) is seen in the nucleus of hepatocytes in the liver (A and D), mucosal epithelial cells of the small intestine (B and E) and colon (G), and the proximal tubules of the kidney (C and F). Epithelial cells of the stomach (H), pancreas (I), glomerulus, distal tubules, and collecting tubules of the kidney are negative. Paraffin sections show the same staining pattern as frozen sections. Original magnification: D, E, F ×400; A, B, C, G, H, I ×200. In order to test whether the expression of the HNF4α protein paralleled a corresponding expression of the mRNA, RT-PCR and GeneChip analysis were carried out using several human tissue RNA samples. The RT-PCR results are shown in Fig. 5. Primers that can amplify the amino-terminal region of HNF4α1/α2/α3 were used. Although HNF4α4/α5/α6 must be detectable using these primers, amplified PCR products corresponding to these isofroms were not detected. HNF4α P1 promoter transcripts are detected only in kidney, liver, colon, and small intestine by RT-PCR analysis as HNF4α protein is observed in certain tissues only (Fig. 5). Table 1 summarizes the results of the immunohistochemical study and mRNA levels detected by RT-PCR and GeneChip analysis. GeneChip analysis also clearly showed a moderate to high level of expression of HNF4α mRNA in the liver, kidney, small intestine, and colon. These findings are consistent with the immunohistochemical study showing protein expression in these tissues, suggesting again the specificity of our antibody. Taken together, these results suggest that our monoclonal antibody against human HNF4α specifically detects endogenous protein. RT-PCR analysis of the amino terminal domain of HNF4α1/2/3 transcript in normal human tissues. Total RNA was reverse-transcribed and amplified. Primers corresponding to the A/B domains (see Fig. 1B) were used to amplify products of 138 bp. PCR products were resolved on 2% agarose gel with ethidium bromide. Expression of HNF4α protein and mRNA in human and rat tissues. 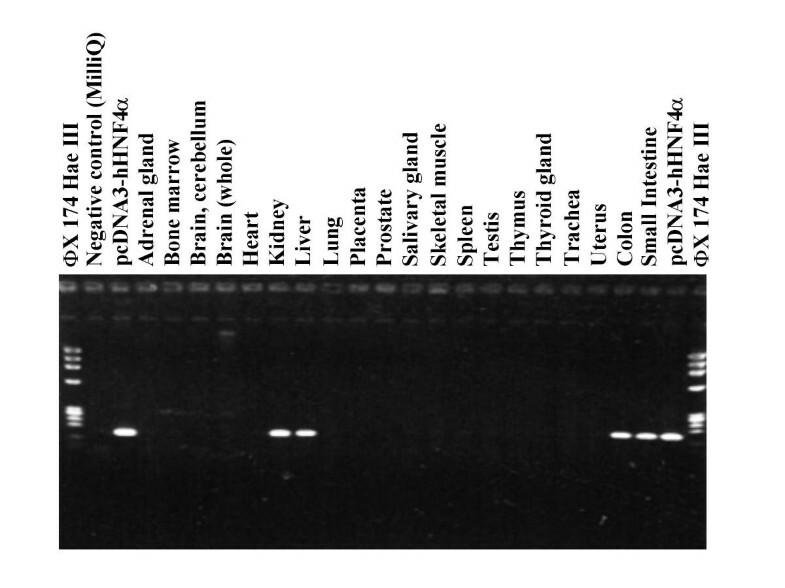 Summary of HNF4α protein and mRNA expression levels in human and rat tissues. +, positive; -, undetectable; n.t., not tested. Data were taken from both results shown in Figs. 2, 3 and 5. In this study we have generated a monoclonal antibody against the amino-terminal domain of human HNF4α1/α2/α3. This antibody has been useful in Western blot analyses and in immunohistochemical studies of P1 promoter-driven HNF4α isoforms cellular localization within tissues of humans and rats. Furthermore, this antibody is applicable to formalin-fixed and paraffin-embedded tissues as well as frozen tissues (Fig. 2 and our unpublished data). Since the production of monoclonal antibodies has been limited by the considerable time required for the production and purification of recombinant proteins, the inability in many instances to obtain natively folded protein, and the limited size and diversity of peptide epitopes, we decided to use baculovirus particles displaying surface gp64 fusion protein as an immunizing agent. Using these approaches, we have cloned a hybridoma cell line that produced HNF4α-specific monoclonal antibody with high affinity to the antigen, as demonstrated by Western blot analysis and immunohistochemistry. The immunohistochemical localization of HNF4α protein reported here is in accordance with that of the expression of HNF4α mRNA determined by RT-PCR and GeneChip analysis indicates the utility of this antibody for the detection of HNF4α. The generation of antibody has been impeded by the requirement of purified protein or peptides for use as the immunizing agent. In addition, bacterial expression systems have proven to be of limited use in the generation of antibodies to recognize antigens in their native configurations due to the complexity of eukaryotic protein modification and folding. It has been reported that a variety of proteins which require complex folding or extensive posttranslational modification have been successfully expressed and used as antigens for the production of monoclonal antibodies with baculovirus expression systems [27–29]. With this method, production of the gp64-fusion protein is easily verified using an anti-gp64 monoclonal antibody. In addition, we have demonstrated that gp64 fusion protein can be highly expressed on the recombinant virus surface . This allowed us to use recombinant viral particles as the immunizing agent without a purification step. Thus, these results suggest that this method has the potential to produce valuable antibodies without further purification. To date, much of the analysis of HNF4α cellular localization has been done at the RNA level, by Northern blot analysis, in situ hybridization, RNAase protection assay or RT-PCR on RNA isolated from developmental cells at different stages and distinct cell populations within tissues [20–24, 31]. These studies have shown that the liver, kidney, small intestine and colon are predominant tissues for the vertebrate HNF4α isoforms. In addition, substantial levels of HNF4α mRNA are found in the pancreas and stomach. K9218 clearly showed predominant immunostaining of nuclear localized HNF4α protein in hepatocytes of liver, mucosal epithelial cells of intestine and colon, and proximal tubules of the kidney in humans and rats. In contrast, the nuclear localization of HNF4α in pancreas and mucosal epithelial cells of the stomach is not detected by K9218 immunostaining. P2 promoter-driven isoforms are not recognized although K9218 recognizes HNF4α isoforms originated from P1 promoter (Fig. 1C and T. Tanaka et al. unpublished data). From these results, it suggests that P2 promoter-driven HNF4α isoforms are specifically expressed in some restricted tissues, e.g. stomach and pancreas, and have distinct properties. In fact, HNF4α isoforms containing a unique N-terminal sequence encoded by exon 1D, reportedly absent in kidney but present at high levels in stomach, was also found in a dedifferentiated cell line . As described recently [32, 33], HNF4α transcripts of the pancreas contain exon 1D, but those of liver or kidney exclusively contain the exon 1A sequence, whereas both forms are expressed in small intestine. HNF4α transcripts containing exon 1A were up-regulated at birth and represented the only isoforms in adult-like hepatoma cells, while transcripts containing exon 1D were abundantly expressed in embryonic liver and fetal-like hepatoma cells . Interestingly, the HNF4α transcript containing exon 1D is already diminished two days after birth and practically undetectable two weeks later. At present, the precise expression profile of P2 promoter-driven HNF4α isoforms and its significance in endoderm development are not clear, and should be clarified in further studies using other antibodies against the carboxy terminal domain or amino terminal domain of HNF4α7/α8/α9. HNF4α is a unique member of the nuclear receptor superfamily for several reasons. In general, the activity of a nuclear receptor can be controlled by several fashions, i.e., binding of ligand, covalent modification, and protein-protein interactions, generally through contact with other nuclear receptors and cofactors. These mechanisms can either work individually or in concert to modulate a specific signal. HNF4α, by contrast, binds DNA only as a homodimer with a relatively high affinity, and is also capable of promoting transcription in the absence of exogenously added ligands [34, 35]. Consequently, the expression levels, subnuclear distribution and post-translational modification of HNF4α protein seem to be critical determinants of its transactivation potency, not activation or interaction by ligand with other nuclear receptors and heat shock protein as seen in steroid hormone receptors. Certainly, an exclusively nuclear staining was observed, indicating that HNF4α is constitutively translocated to the nucleus in the physiological state. In addition, immunoelectron microscopic analysis clearly demonstrated that HNF4α had a chromatin-like distribution and formed nuclear clusters. Much evidence has been accumulated suggesting that the intranuclear localization of nuclear receptors is closely related to transcriptional activity. It has been shown that ligand-activated nuclear receptors, such as androgen receptor, glucocorticoid receptor, and mineralocorticoid receptor, formed nuclear clusters, whereas the distribution of inactivate receptors is homogeneous [36–39]. Furthermore, Ktistaki et al. reported that the activity of HNF4α is post-translationally regulated by tyrosine phosphorylation and thereby concentrated in distinct nuclear compartments. In contrast, compartmentalization was disrupted by the tyrosine phosphorylation inhibitor genistein. From these observations, although the exact meaning of the localization in the nucleus remains to be elucidated, HNF4α appears to be mainly localized in the transcriptionally active region (euchromatin) under physiological conditions. The experiments reported herein indicate the utility of our antibody for the detection of HNF4α isoforms originated from P1 promoter in humans and rats. This antibody should be useful for clarifying the presence of HNF4α isoforms in various tissues and several developmental stages, and for the investigation of the interactions between HNF4α and other nuclear proteins such as cofactors. Male and female Wistar rats (260–300 g) were obtained from Charles River Inc. Japan (Tokyo, Japan) and maintained under standard conditions at the Laboratory Animal Center of Niigata University School of Medicine. All animals were allowed free access to laboratory chow and tap water. Livers and other tissues were obtained after cervical dislocation. Human tissues were obtained from autopsy cases in which the autopsy was conducted within 5 hours of death. Hep G2, Huh7, Caco-2 and HEK293 cells were grown in Dulbecco's modified Eagle's medium (DMEM, Sigma) supplemented with 10% fetal bovine serum (FBS, Sigma), 100 units/mL penicillin G sodium, and 100 μg/mL streptomycin (Gibco BRL). 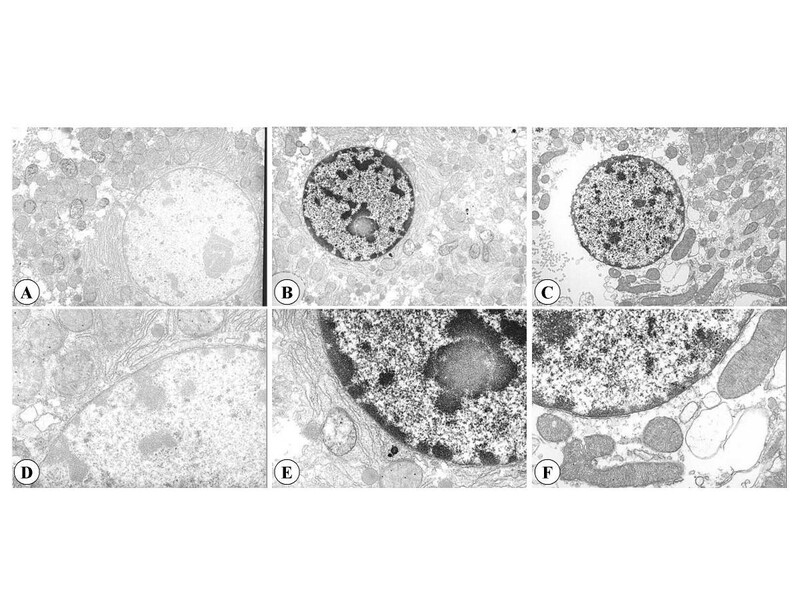 Chinese Hamster Ovary (CHO) cells were cultured in Nutrient Mixture F-12 HAM (Sigma) supplemented with 10% FBS, 100 units/mL penicillin G sodium, and 100 μg/mL streptomycin. We have reported that foreign proteins can be displayed on the surface of Autographa californica multiple nuclear polyhedrosis virus (AcMNPV) and produced monoclonal antibody by directly introduced the recombinant virus into mice in the absence of a protein purification step . The human HNF4α1/α2/α3 cDNA encoding amino acids 3–49 was amplified by polymerase chain reaction (PCR) with primers 5'-GGGGTACCCATGGCCGACTACAGTG-3' and 5'-GGGGTACCGCGCTGACACCCAGGCTG-3', and ligated into the gp64 gene to create a fusion protein on the viral surface (Fig. 1). This expression cassette was then inserted into the viral DNA by homologous recombination via co-transfection of the transfer vector and baculovirus DNA (Bac-N-Blue DNA, Invitrogen) into Spodoptera Frugipedra (Sf9) cells. Following two rounds of purification, recombinant virus was injected into 6-week old female BALB/c mice. Three days after the final administration, mice were sacrificed and lymphocytes from the spleen were fused with NS-1 myeloma cells using polyethylene glycol. The fused cells were cultured in HAT (0.1 mM hypoxanthine, 0.16 mM thymidine and 0.1 mM aminopterin) selection media for 10 to 14 days at 37° to select for surviving fusion clones. Hybridoma tissue culture supernatant containing the surviving clones was tested by ELISA and immunoblot analysis to confirm specific immunoreactivity to the antigen. The fusion clones selected in the primary screening were further divided into single-cell subclones, which were tested by immunobloting using transfected and expressed full-length HNF4α protein. Whole cell extracts from HNF4α-transfected CHO or cultured cells were resolved by SDS-polyacrylamide gel electrophoresis (10%) and electroblotted to ProBlott membranes (Applied Biosystems). Membranes were blocked with Block Ace (Dainippon Pharmaceutical) for 1 hour at room temperature. The blot was probed with mouse anti-human HNF4α-specific monoclonal antibody (K9218) and then incubated with anti-mouse IgG horse-radish peroxidase-conjugated antibodies (Sigma). Proteins were detected using SuperSignal® West Dura Extended Duration Substrate (Pierce). CHO cells were plated in 6-well plates at 1.3 × 105 cells 18 hours prior to transfection. Transfections were performed with TransIT LT-1 transfection reagent (Mirus) using 2 μg of pcDNA3-hHNF4α2 or pcDNA3-hHNF4α3 expression vector per well. Several cultured plates and HNF4α-transfected plates were washed twice with ice-cold PBS and the cells harvested by scraping into ice-cold PBS. Cells were pelleted by centrifugation at 2,000 × g for 5 min, and resuspended in ice-cold lysis buffer (20 mM Hepes pH 7.9, 20% (v/v) glycerol, 400 mM KCl, 0.5 mM EDTA, 1 mM DTT, 2 μg/mL aprotinin, pepstatin A and leupeptin, and 0.5 mM PMSF). The cells were then lysed by three freeze-thaw cycles (liquid N2 bath for 3 min followed by incubation at 37° for 3 min) and the cellular debris was pelleted by centrifugation at 20,000 × g for 10 min. The protein concentration in the supernatant was determined by Bradford assay (Bio-Rad) according to the manufacturer's instructions. Rat and human tissues were fixed for 1 day at room temperature in 10% formalin. The samples were sequentially dehydrated with an alcohol series and embedded in paraffin. For comparison, some tissues were fixed for 4 hr at 4°C with periodate lysine-paraformaldehyde (PLP) and were embedded in OCT compound (Miles, Elkhart, IN). The paraffin sections (4 μm thick) were treated with avidin, biotin, and normal horse serum to minimize non-specific staining. These tissues were incubated with a monoclonal antibody against HNF4α (K9218) dissolved in 1% BSA/PBS at a final concentration of 10 μg/mL for 2 hr at 25°C or overnight at 4°C. After several washes with PBS, the sections were stained with anti-mouse IgG for 1 hr (Vectastain Elite ABC kit, Vector, CA). To prevent endogenous peroxidase reactions, the samples were pretreated with 0.3% H2O2 in cold methanol for 30 min and were subsequently incubated with avidin and HRP-conjugated biotin for 30 min. Finally, 0.1 mg/mL of 3, 3'-diaminobenzidine (DAB) tetrahydrochloride was applied to sections for 5 min. In order to assign the HNF4α-associated immunostaining, the sections were counterstained with hematoxylin. The immunohistochemical staining patterns were examined using samples collected from 3 individual rats and autopsy cases. To confirm the specificity of the immunohistochemical localization, antibodies preabsorbed with an excess of antigens were used. For immunoelectron microscopic detection of HNF4α, rat liver and kidney were fixed with PLP for 1 hr and cut into 50-μm-thick sections with a vibratome (DTK-1000, Dosaka, Osaka, Japan). After the inhibition of endogenous peroxidase activity by the method of Isobe et al. the sections were immunostained with 10 μg/mL of K9218. These samples were incubated with a peroxidase-conjugated anti-mouse IgG (Fab fragment, NA9310, Amersham, England) and were developed with DAB. Thereafter, they were postfixed with 1.0% osmiun tetroxide for 2 hr. After dehydration in a graded series of ethanol solutions, the samples were processed through propylene and were embedded in Epon 812 (E. Fullan, Inc., Latham, NY). Ultrathin sections were stained with uranyl acetate and lead citrat, then examined with an electron microscope (H-800, Hitachi, Tokyo, Japan). Other reagents were obtained from Sigma Chemical (St.Louis, MO). Fifteen out of twenty samples prepared from pools of human total RNA were purchased from Clontech (Human Total RNA Master Panel II, Palo Alto, CA). To synthesize first-strand cDNA, RNA was annealed to a random hexamer and extended with SuperScript II reverse transcriptase (Invitrogen, Calsbad, CA) according to the manufacturer's recommended protocol. PCR was carried out on the first-strand cDNA using the primers written in the section on the preparation of monoclonal antibody. After an initial melting step at 94°C for 3 min, the oligonucleotide primers were melted at 94°C for 30 sec, annealed to the cDNA template at 60°C for 30 sec, and extended at 72°C for 1 min. After 30 cycles, the reaction was extended at 72°C for 5 min. The amplification products were analyzed on 2.0% agarose gels stained with ethidium bromide. Four out of five RNA samples prepared from pools of human RNA were purchased from Clontech (Palo Alto, CA). These are listed followed by the number of tissues pooled and the Clontech catalog number in parentheses: salivary gland, pooled (64026-1); testis, 19 (64027-1); trachea, 84 (64091-1); adrenal gland, 61 (64096-1); whole brain, single donor, (64020-1). Those prepared from polyA RNA are also indicated in parentheses; for others, total RNA was used. Twelve total RNA samples prepared from a single donor were purchased from Ambion (Austin, TX). Catalog numbers for these tissues are in parentheses: placenta (7950); pancreas (7954); thymus (7964); heart (7966); spleen (7970); ovary (7974); kidney (7976); skeletal muscle (7982); small intestine (7984); colon (7986); prostate (7988); bladder (7990). Four total RNA samples were purchased from Strategene (La Jolla, CA): breast, single donor (735044); uterus, 3 (735042); thyroid, single donor (735040); and skin, 2 (735031). In addition, normal human tissue from liver, stomach and lung was obtained with informed consent. Total RNAs were extracted from these specimens using ISOGEN (Wako Pure Chemical Industries, Japan). Experimental procedures for GeneChip were performed according to the Affymetrix GeneChip Expression Analysis Technical Manual. Briefly, 10 μg of RNA was used to synthesize biotin-labeled cRNA, which was then hybridized to the high-density oligonucleotide array (GeneChip Human U133 array; Affymetrix, Santa Clara, CA). After washing, arrays were stained with streptavidin-phycoerythrin, and image data were collected and analyzed using a Hewlett-Packard Scanner. The GeneChip Analysis Suite software version 5.0 was used to calculate the average difference (Avg. Diff.) for each gene probe on the array. The average differences were normalized for each array such to have a mean value of 100. Shuying Jiang, Toshiya Tanaka contributed equally to this work. The authors would like to acknowledge C. Nagao, S. Yushina, J. Ishida, W. Kamiya, M. Yoshikawa, K. Sato, K. Ohyauchi, T. Aoyama, and S. Momozaki for excellent technical assistance. This work is, in part, supported by a grant from Joint Research & Development Projects with Academic Institutes and Private Companies. S. Jiang and H. Hotta participated in the immunohistochemical study. T. Tanaka carried out the molecular genetic studies and drafted the manuscript. Y. Watanabe and Y. Uchiyama participated in the construction of the baculoviral transfer vector. H. Yamashita, J. Kumakura and H. Iwanari participated in the immunization. H. Aburatani and T. Hamakubo participated in the study design of the study. T. Kodama and M. Naito conceived of the study and participated in its design and coordination.